All the tools you need for a swirl-free finish! The Pinnacle Griot’s Garage Swirl Remover Kit is the only kit you need to restore the shimmer and gloss to your vehicle’s paint. 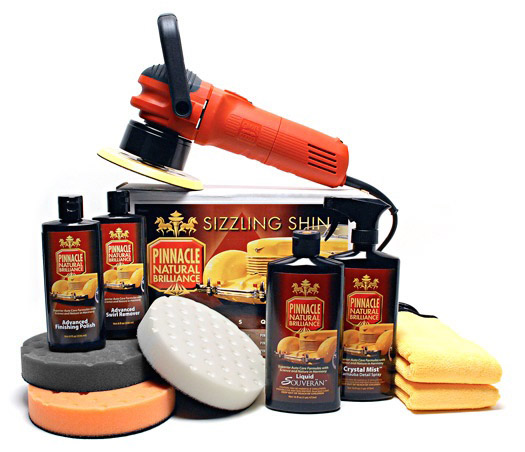 This all-inclusive kit combines the polishing power of the Griot’s Garage 6 Inch Random Orbital Polisher with the intense correction capabilities of the Pinnacle product line. The Pinnacle Griot’s Garage Swirl Remover Kit will tackle unsightly swirl marks, light scratches, water spots, and other imperfections leaving your paint glossy and smooth. The Pinnacle Griot’s Garage Swirl Remover Kit is perfect as an introductory kit for beginners, or as a supplement to any pro detailer’s toolbox. The Griot’s Garage Polisher features random orbital motion, which is ideal for beginners, yet it has enough power to eliminate the surface flaws that make paint look dull. The kit also includes the pads and towels you’ll need to get started! The Griot's Garage 6 inch Random Orbital Polisher features a powerful 750 watt motor that operates between 2500 and 6800 OPM. The result is an aggressive, yet safe polishing action that powers through swirl marks faster than other DA polishers. The random orbital design makes this safe for beginners, yet the powerful motor makes this the choice of many professionals. This firm, high density pad is perfect for moderate to aggressive polishing. Use CCS 6.5 Inch Orange Light Cutting Pads to apply compounds, and medium to aggressive polishes to remove swirl marks, compounding haze, and other moderate defects. Use this pad with a medium grade polish to remove swirl marks and other moderate paint blemishes in conjunction with this kit. This firm, dense pad is ideal for most polishing situations and creates a high-quality finish. Use the CCS 6.5 Inch White Polishing Pads to apply final polishes, to remove swirl marks, light compounding haze, and light paint defects while creating a high gloss finish. Use this pad with a finishing polish to remove any light haze or minor paint defects in order to create a flawless shine. This soft, imported pad has no mechanical action. Use CCS 6.5 Inch Black Finishing Pad to apply a final coat of wax or sealant, or for final polishing on extremely delicate paint. Use this pad with your favorite protectant to seal in the shine created on with the previous steps in this kit. A total retail value of $342.90. You save $32.91! Upgrade to the Heavy-Duty Griot's Garage 6 inch Random Orbital Polisher! The HD model has a heavy-duty 16 gauge, 25 foot power cord hardwired into the polisher. The longer cord is more convenient than an extension cord and it is gauged to deliver maximum power to the polisher for safe, efficient operation. Select the HD model from the drop-down menu at the top of the screen.